These soft unique sponges are gentle enough for babies skin. Used for thousands of years in Asia for their PH balancing and beautifying properties, freeze-dried Konjac root sponges are great for any skin condition from sensitive skin, acne, dermatitis and eczema and are gentle enough to cleanse areas with wounds and abrasions. Dew Puffs are made from the freeze dried fiber of an Asian root vegetable called the Konjac. 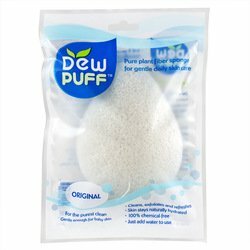 The original Dew Puff contains only one all natural sustainable ingredient - Konjac. The Asian Clay as well as the Charcoal contain only two ingredients. For thousands of years, Japanese people have been eating food made from this konjac fiber called `Kon-nyaku`. The dietary fiber made from konjac fiber (which is the main ingredient of kon-nyaku food) has an amazing ability to retain water. This also makes konjac fiber an ideal ingredient for moisturizing facial sponges. Dew Puff is very gentle and slightly alkaline It is soft and moisturizing when soaked in water. Gently massaging skin with a moist Dew Puff is refreshing and provides a unique extremely gentle exfoliation effect which brightens the skin. The alkaline nature of the sponge neutralizes acidic substances on the skin and allows them to wash away harmlessly without the use of soap! Is the original pure sponge made only from pure konjac fiber. Is infused with a natural bamboo charcoal powder which provides extra bacteria fighting power and helps remove toxins from the skin. Is infused with Asian clay which is excellent for dry, sensitive and mature skin. I'd love to try one of these! I would like to exfoliate every once in a while but don't want to use anything too harsh, so this is perfect!